1. Made of high quality EVA foam material, soft and durable. 2. Non-toxic memory EVA foam, come with sticky circles. 3. The shapes give you lots of options to insert gadgets around them, and still have room for some airflow. 4. Great kit for inside your helmet. 5. Suitable for fast helmet and other modifications helmets. Package Included: 19 x EVA Helmet Pads Not included the helmet. Made of high quality Non-Toxic EVA foam material, soft and durable,provides maximum comfort and stability. Used to replace the worn out or missing pads in your helmets ,to make the helmet fit more snug/tight. 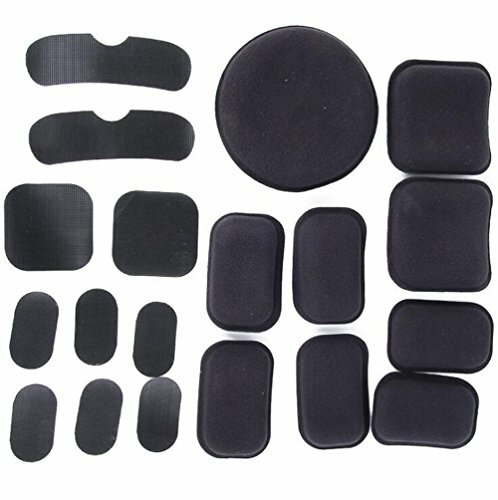 Our helmet pads minimizes helmet movement and holds helmet comfortable in place,providing pain-free protection . The shapes give you lots of options to insert gadgets around them, and still have room for some airflow. Suitable for fast helmet and other modifications helmets. Great kit for inside your helmet. Easy washable and durable, quick-drying. Easy installation and remove. If you have any questions about this product by Tfwadmx, contact us by completing and submitting the form below. If you are looking for a specif part number, please include it with your message.